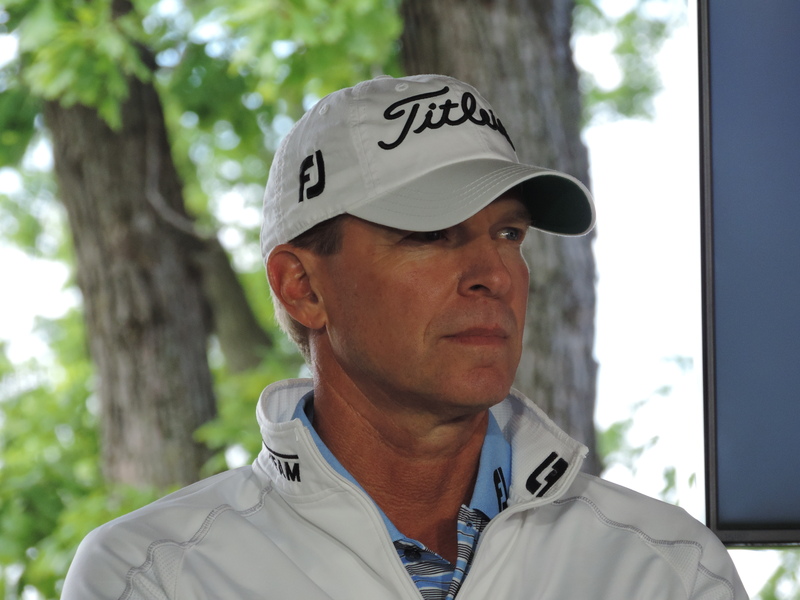 Steve Stricker – Photo Courtesy of the PGA of America. To nobody’s surprise, Madison’s Steve Stricker was named the captain for the 2020 United States Ryder Cup team that will battle the Europeans at Whistling Straits near Kohler from Sept. 22-27, 2020. 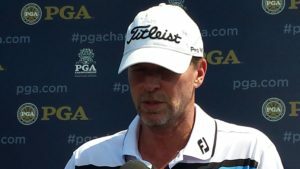 Stricker said he had prepared himself not to cry, but that didn’t last long as he fought back tears early on during Wednesday’s PGA of America press conference at Fiserv Vorum. Stricker has experience for the job, serving as a Ryder Cup Vice Captain in 2016 and a President’s Cup Captain in 2017. Stricker has been involved in a number of big events during his career but admitted today that it doesn’t get any better than this. 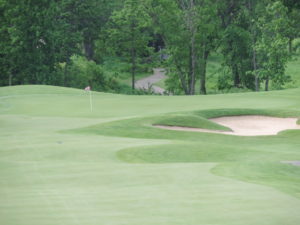 Edgerton’s Steve Stricker has earned a spot in next weeks U.S. Open Field, qualifying in Memphis, Tennessee on Monday. Stricker shot rounds of 68 and 65 in 36-hole sectional qualifying to earn a spot in the U.S. Open field June 14-17. Stricker has 12 wins on the PGA Tour and a pair of wins this year on the PGA Tour Champions, but he has never won a major. He does have 13 top-10 finishes, four of them in the U.S. Open. Stricker’s best finishes came in 1999 when he finished fifth. He tied for fifth in 1998. Last year, Stricker also advanced through sectional qualifying and tied for 16th at Erin Hills. 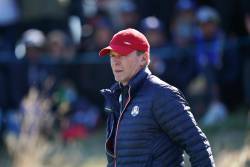 U.S. Captain and Madison native Steve Stricker selected Phil Mickelson and Charley Hoffman as his two captains picks for the upcoming Presidents Cup. Mickelson was in danger of missing his first Presidents Cup or Ryder Cup since 1993. He hadn’t played well this year, but Stricker gave Mickelson until the very end to prove himself and that he did. Mickelson shot all four rounds in the 60’s last weekend at the Dell Technologies Championship in Boston and tied for 6th. Hoffman finished a fraction of a point out of the top 10 automatic qualifiers in the final week and will be playing in his first team competition for the United States. International Captain Nick Price picked Emiliano Grillo and Anirban Lahiri as his two captains choices. The National Liberty Golf Club in Jersey City, New Jersey will play host to the Presidents Cup September 28 through Oct. 1. 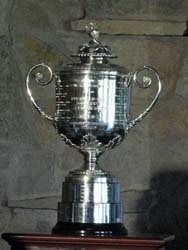 The United States captured the last Presidents Cup competition, 15.5 to 14.5 back in 2015. Madison’s Jerry Kelly and David McKenzie shot 7-under-par 65’s on Friday to share the lead after the first round of the Champions Tour’s Boeing Classic in Snoqualmie, Washington. McKenzie eagles the par 5-eighth to join Kelly atop the leader board. Jordan Spieth reeled off five straight birdies on the back nine for a 5-under 65, moving into a four-way tie for the lead with Dustin Johnson, Rickie Fowler and Jhonattan Vegas after two rounds of The Northern Trust in Old Westbury, New York. Madison’s Steve Stricker had a 70 and missed the cut. The top 100 players in the Fed Ex Cup point standings after the weekend, head to the second event in the chase for the championship next week in Boston. Bryson DeChambeau came from four shots back to win the PGA Tour’s John Deere Classic by one shot on Sunday in Silvis, Illinois. The victory is DeChambeau’s first on the PGA Tour and earned him a spot in this week’s British Open. DeChambeau birdied four of the final six holes at TPC Deere Run, shooting a final round 6-under 65. He finished 18-under par for the tournament. Third-round leader Patrick Rodgers shot a 70 to finish in second place. Wesley Bryan (64) and Rick Lamb (66) tied for third at 16-under par. Three-time champion Steve Stricker shot a seven under par 64 and actually climbed into the lead early in the day before finishing at 15-under par.